East Everglades Orchid Society (EEOS) welcomes you to the amazing world of orchids! Our meetings are open to the public and are held the fourth Tuesday of the month at 7:30 pm, at the University of Florida Miami Dade County Agricultural Extension Building, located at 18710 SW 288th Street. This is where members get to hear the best talks on their favorite orchid topics and get to know each other while dining after the talk. We also have a section of ribbon judging where members bring their plants to be evaluated by our expert judges. 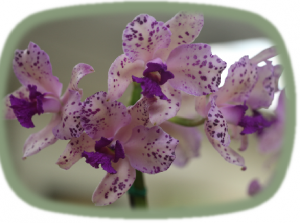 Members and guests can bring their problem orchids for advise from more experienced members. Last but not least, we provide the best opportunity for attendees to increase their collections when they buy raffle tickets to win incredible, beautiful orchids. If you navigate through this website, you will find detailed information on our society, including membership, our schedule of monthly meetings and numerous other events, judging results, orchid culture, member’s orchids, annual calendar, questions and answers, and orchid wallpaper. Our latest addition is a Facebook page (East Everglades Orchid Society), where you can interact with other orchid lovers and share their knowledge and ideas. I hope you have fun navigating the EEOS website and remember, you don’t need to be a member to attend our meetings. The goal of our society is to educate ourselves and the general public in the classification, evolution and propagation, culture, care, and development of the cultural and economic importance of orchids; and to support the conservation of this fascinating group of plants. Membership is open to anyone who is interested in the objectives, aims, and purposes of the East Everglades Orchids Society.